The amount of sun's rays that is reflected by an earthly body is called albedo. The word albedo is derived from albus, a Latin word for white. 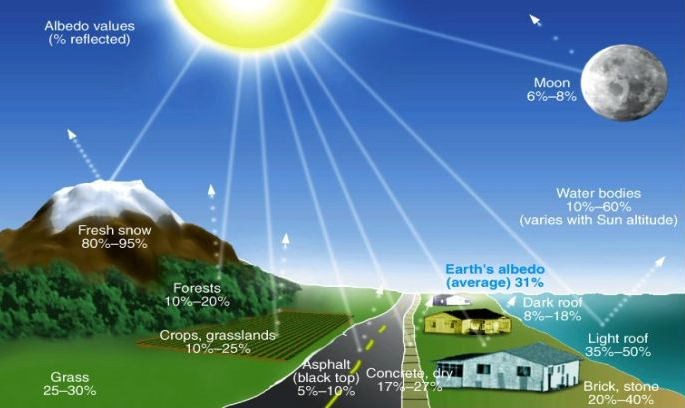 Albedo is a measure of how much light that hits a surface is reflected without being absorbed. Something that appears white reflects most of the light that hits it and has a high albedo, while something that looks dark absorbs most of the light that hits it, indicating a low albedo. It is the reflection of a certain area of earth, like snow and mountains, on the surface. For example, the albedo of snow covered mountains hurts the eyes.